Love rum? Fresh juices? Puerto Rican cocktails go far beyond the likes of Pina Coladas. I eschewed the cocktail reminiscent of 7-11 Slurpees for acerola and rum, artisan cocktails, and mojitos because I like my Slurpees childish and tasting of corn syrup and food coloring. The following is a rundown of what I ate and drank in Puerto Rico, snark, praises, and ramblings. This is not an explanation of where you should eat in Puerto Rico nor will you learn anything about Puerto Rican cuisine. It is my experience and take from it what you will. Fish tacos of disappointment from El Vagon. El Vagon is one of those places that tourists rave about on Yelp. I should know better at this point not to trust Yelp reviewers but I was going into Puerto Rico food blind. None of my trusted sources (friends and food/travel bloggers) had been to Puerto Rico and talked about the food in detail. Yelpers raved these were the best fish tacos they'd ever had in their life. Multiple people. Many people. Sigh. They must not be from California, Texas, New Mexico, Arizona, or even Seattle. The fish was moist and the tortillas were good quality, but the slaw on top was more mayonnaise than slaw and it was bordering on revolting. Service was on the mediocre side; they forgot my drink, handed me a bottle of water, and then acted like I was a jerk because I reminded them they forgot to bring my drink. Some Yelpers think this permanent food truck is in "the 'hood" because it's next to a gas station. Right. It's in a perfectly decent area and just because there are stray cats around the corner does not mean you're going to be the victim of a drive-by. Superior fish tacos from Tresbe in Ocean Park. Ocean Park is an upscale neighborhood right next door to Condado and Santurce; there's some debate that both Ocean Park and Condado are in the larger of Santurce. I'm completely ignorant of all the finer points of San Juan geography, so I will stay out of that argument. I will make the argument that the fish tacos from Tresbe are on point. The fish is moist and the sauce is creamy and spicy without overpowering the fish or the cabbage. 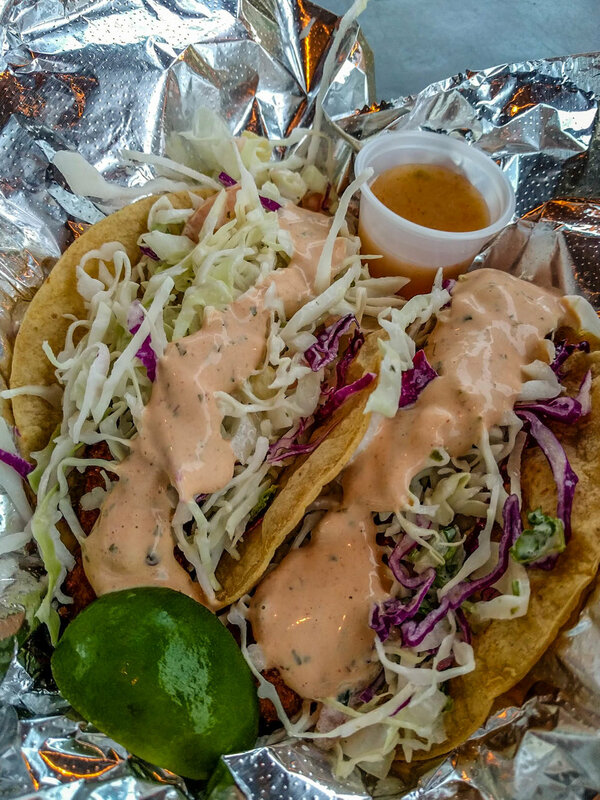 They add small chunks of pineapple and the spicy papaya sauce that accompanies the tacos brings a necessary acidity and tangy spiciness. Like many places in San Juan, service can be a little confusing here. If you're ordering in, sit down at one of the outdoor tables, and a waitress will come by to take your order. If you're ordering to go, then go up to the window and order. They accept credit and cards with a minimum of ten dollars. The service, like most places in San Juan, is off-hand but when I'm dining alone I prefer it that way. I ordered my tacos with fresh tamarind juice. I would definitely recommend coming here for a relatively cheap bite and fresh juice. SPOON FOOD TOUR: "OLD SAN JUAN WALK & TASTE TOUR"
Situated on the bottom floor of a repurposed army barracks in Old San Juan, Cafe Don Ruiz was the first stop on my food tour with Spoon Food Tours. I can't recommend my time with Spoon enough and think it is a must for anyone who loves food and visits Puerto Rico. My guide, Pablo, was informative, funny, and generous with his time. At Cafe Don Ruiz, we were served a sample of a Mallorca, the challah-like egg bread with powdered sugar that is served at all bakeries in San Juan. A medium roast latte accompanied the Mallorca and was tasty without any sweetener. The atmosphere at Cafe Don Ruiz is relaxed, and I returned several days later to enjoy a pesto and ham sandwich after a walk around El Morro. The second stop on our food tour was La Tortuga Pizzeria and Panaderia. have you ever had a quesito? It might be the most delicious cheese filled pastry ever. Well, it's up there with the guava paste and cheese pastelito from Tatiana's. Imagine a pastry flauta with a slightly savory cheese filling and covered with a sugar glaze. It was so sticky I couldn't take a picture of it. Crappy photo but delicious mofongo with garlic cream sauce and chicken. The third stop on my Spoon Food Tour, Hecho en Casa is a farm to table restaurant decorated with incredible artwork from local artists. I thought I hated mofongo until I ate the chicken mofongo with garlic cream sauce from Hecho en Casa. The sauce elevated the heavy mashed plantains to something creamy and delicious. Beware bad mofongo. Acerola juice with white rum. Following the stop at Hecho en Casa was Deaverdura, a kitchen and juice bar. The kitchen served traditional roast pork (lechon) with a bean stew and, you got it, rice. I ordered the acerola juice because I've never had it before with white rum. Refreshing but not my favorite flavor. My first morning in San Juan I had no idea where to eat breakfast but I wanted to see Old San Juan. Looking at Google maps, one of the only places marked is Casa Cortes ChocoBar. An upscale and touristy chocolate focused restaurant, this was the most uncomfortable I felt eating the entire trip. I had not got into the headspace of dining alone, something which I still have to mentally prepare myself for. I had the churros and Puerto Rican hot chocolate, both far too decadent for breakfast. The Puerto Rican hot chocolate comes with cheese slices, a mini chocolate bar, and chocolate chips. They gave me a different churros dish than what I ordered and was twice the price. Puerto Rican hot chocolate. Isn't that chocolate bar the cutest? And those mini chocolate chips? Sitting at the bar, I witnessed firsthand the manager/hostess bitching the staff out for the lack of attentiveness. If you have to yell at your staff, you're doing something wrong as a manager. Churros with two chocolate sauces and marmalde. Mallorca sandwich from Pinky's Condado. Right in the tourist strip (trap) of Condado, across from the major hotel chains, is Pinky's, a hole in the wall sandwich and breakfast joint. Serving enormous portions for a steal, Pinky's is a popular breakfast destination for tourists and locals. I visited Pinky's twice in the early morning during my stay in San Juan. The first time around I ordered a Mallorca sandwich, a gargantuan three egg sandwich with Swiss cheese and grilled ham served on a Mallorca roll, an egg bread with powdered sugar. The eggs were inconsistently cooked: one was perfectly runny and the other two were hard. The ham lacked in flavor and the cheese brought little to the sandwich. It did last me two meals and cost less than seven dollars. Baguette with egg white scramble. Delicious. The second time around I ordered an egg white scramble with basil and goat cheese with toast and an iced cafe con leche with brown sugar. This is where it is at. Egg white scramble sounds like torture, but the eggs were tender and creamy. The goat cheese brought richness, and the basil a needed fresh herbaceousness to the eggs. The bread was soft and generously buttered. The iced cafe con leche is worth going to Pinky's alone. Some might think the waitresses at Pinky's a little on the surly side, but I like their rolling-eyed sarcastic manner. They bring your food quickly, give change correctly, and ask if you need anything else once or twice during the meal. What more do you want at seven thirty in the morning? What do you do when you're tired of staring at your computer screen and your brain grinds to a halt? Why you can get drunk at San Juan's very own hipster bar: Parcela. I arrived at 4:30 to a completely empty restaurant and a closed kitchen, so I knocked back a couple of extravagantly priced and bitter cocktails, ate a microwaved overpriced pretzel with broken cheese sauce, and lectured the bartender about short ribs and collagen. After an hour and a half, the kitchen opened, so I ordered the goat with homemade pasta. I was already full from my pretzel and booze, but I wanted to try the real food here. The goat pasta was delicious: tender goat, balanced tomato sauce, and chewy but light pasta. I felt like I was in Oakland or SF, stuck up hipster waiters with silly mustaches and all. The bitters were strong with this one. A cheese sauce is incorrectly made or reheated when it breaks into fats and liquids. Serious Eats Food Lab taught me all about it. The guide from my adventure tour recommended Orozco's, and there were a number of locals sitting around so it's not just a tourist trap restaurant on Calle Ashford. I came early, around five-thirty, because I read the wait can get crazy here. I ordered the shrimp with creole sauce, rice with pigeon peas, and fried plantains. I couldn't get enough of the fried plantains, especially with the housemade hot sauce. I wish I could have bought a bottle of that hot sauce to take home because it was one of the best things I ate in Puerto Rico, a land of many delicious spicy sauces. The shrimp were properly cleaned, tender, and the tomato-based sauce tasty. There could have been more sauce, particularly because the arroz con gandules was dry, dry, dry. Shrimp creole with plantains and arroz con gandules. Service at Orozco's was slow even for Puerto Rico, and the prices are marked up for tourists. My meal cost twenty-five dollars with tip. Other meals included a medianoche sandwich (a ham and cheese sandwich with pickles, which I promptly removed) and a sweet and sour stewed chicken with beans and rice from a farmstead at the end of my adventure tour in the rainforest. Chicken, rice and beans from a rain forest farm. Puerto Rico and I did not start off well with food at the Hacienda Don Jose, a place with an excellent view and overpriced, crappy food, but things got better once I started looking past Yelp and Google maps. I inched closer to getting over my fear of dining alone but I will never give up my book or Kindle app on my phone and just enjoy my meal. I liked the laid-back attitude toward service, something I always I enjoy when I leave the mainland United States. Sad watery Mojito from Hacienda Don Jose. Puerto Rico offers a range of foods and more touristy places cater to vegetarian, vegan, and gluten-free diets. You can find sushi, Italian, Chinese, American, etc in the more touristed areas. Don't give up on mofongo if you try it at one place and hate it. And do not leave without drinking a cup of Puerto Rican coffee.